Beer is the national beverage of Germany but that’s due to the fact that grain is better adapted to the cold northern climate than Chardonnay or Cabernet. Germans have been growing grapes since 1435. Today, they make up 3 percent of the world’s wines. But how much of that 3 percent is produced is greatly dependent on Mother Nature. That’s because Germany is the world’s northern most wine growing region. A good 80 percent of the Qualitatwein, is grown on hillsides above the Rhine River. Since most of the 55,000 acres of vineyards are on south-facing hillsides, handpicking is the only way to harvest as machinery on mountain sides is out of the question. So if you are determined to grow grapes in a cold climate, you better plant grape varieties that don’t mind it so much. Let me introduce you to the great cold hardy Riesling, Muller-Thurgau and Silvaner varieties. All white grapes, all well suited to making a wide range of wine styles. In Germany, there are more than 1,400 wine villages and 3,200 vineyards. In an effort to codify their wines, the German government passed a law – The German Wine Law of 1971. The new law stated that a vineyard must be at least 12 acres of land. It also divided German wines into two categories, Tafelwien (table wine) and Qualitatwein (quality wine). It regulated must weight and minimum alcohol levels. Another rule, if Riesling is on the label, at least 85% if not more, will be in the bottle. And if it shows a vintage on the label, at least 85% of that vintage must be in the bottle. There are thirteen winemaking regions in Germany, most hugging the shores of the Rhine River and its tributaries. Most of the regions are named for the river that runs through it, like the Rhine, Mosel, Saar, Ruwer, and Nahe. Other region names found in the U.S. will be from the Rheinhessen, Rheingau, or Pfalz. German wine labels reveal all. From grape variety to ripeness levels, style and quality levels, alcohol and testing batch number, it’s all right recorded on the label in great detail. First, on a German wine label will be the producer, Dr. 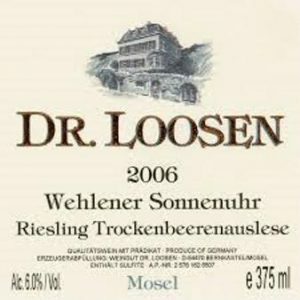 Loosen, for instance; the region, Mosel; the vintage, 2006; the town and the vineyard, for example, Wehlener Sonnenuhr. The er on the end of the town of Wehlen is their way of saying belonging to that town. On older labels, you would see 1989er, meaning from that vintage. Sonnenuhr is the vineyard name. Next would be the grape name, Riesling and the style, Trockenbeerenauslese. The quality level of the wine, QmP and its official testing number – proof that the wine was tasted and passed the strict quality measures required. Alcohol and bottle size are also stated on the label. Ripeness levels mean how ripe the grapes are at harvest. This also, by law, will determine the wine’s quality level and an early indicator of style. There are six styles are Kabinett, Spatlese, Auslese, Beerenauslese, Trockenbeerenauslese and Eiswein. Kabinett – These are typically lighter-bodied, medium-dry wines, made from grapes harvested at the peak of the season. Usually the driest of the Qualitatweins. Spatlese – Translated means “late (spat) picked (lese)” or late harvest, the extra time in the sun allows produces an elevated ripeness level to a fuller bodied wine and increases the intensity of both aroma and flavor. Auslese – Literally means “out picked” designating ripe grapes picked from a specific cluster of berries harvested later than the first harvest. This medium to fuller-bodied Riesling can be crafted into either a dry or a sweet version. This is the first style that may exhibit true dessert wine status. Beerenauslese (BA) – A rare treat, this Riesling is made into the luxurious dessert wines that are sought out for their compatibility with a myriad of dessert options. They are only made when the vintage conditions are just right, adding to the cost and taste. Trockenbeerenauslese (TBA) – Translated as “dry berry out picking” and that adds up to outside the regular harvest, with possible botrytis infected, raisined grapes, and concentrated sugars. Each grape is picked individually, months after normal harvest. These labor intensive, concentrated, nectar like dessert wines can claim quite a price. Eiswein – An even later harvest ice (eis) wines (wein), are left on the vine until frozen, then picked and pressed while frozen, resulting in an exquisite, highly concentrated experience even red wine lovers will appreciate. These styles refer to sugar levels at harvest, and after fermentation, the wine could range from bone dry to super sweet. But remember, this is a colder than usual climate, there is always going to be that crisp, balancing acidity in all styles. Other terms to know for determining the sweetness level of wine are trocken which means dry and halbtrocken which is half-dry or off-dry. If this is not on the label, chances are good that it will be on the sweet side. Keep in mind that sweeter Rieslings can be made in either Kabinett, Spatlese, Auslese or Beerenauslese (BA) and Trockenbeerenauslese (TBA) styles, it just depends on the balance between the acidity, sugar, pH and alcohol. Some wonderful German producers to look for are from the Mosel: Fritz Haag, J.J. Prum, Dr. Loosen, Selbach Oster and Dr. Thanish. From the Rheingau: Schloss Johannisberg, Shloss Vollrads and Robert Weil. A large portion of Washington State was once planted to the Riesling grape. We still have a lot of Riesling planted but not as much as 15 years ago. However, Chateau Ste. Michelle does have lots more Riesling planted than anyone else in Washington State. As a result, Dr. Loosen and Chateau Ste. Michelle partner to produce the Eroica Riesling. This collaboration is a classic that offers lots of citrus, lime and peaches and even a hint of petrol that is frequently found in German Rieslings. German Rieslings are incredibly versatile on the dinner table. Many will age well for a dozen years or so, for top vintages. For dinner, Rieslings are best enjoyed with Asian cuisine, Dungeness crab, white fish, pasta with cream sauce, fresh fruit, creamy cheeses and smoked fish with horseradish. Probst!